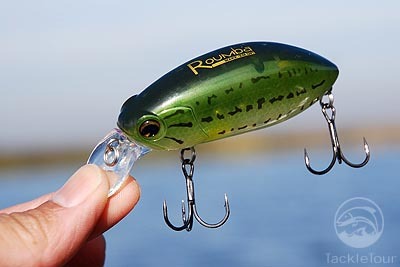 Introduction: The Roumba is an exciting new bait from Ima, a newcomer to the US, but an existing player in the Japanese market. 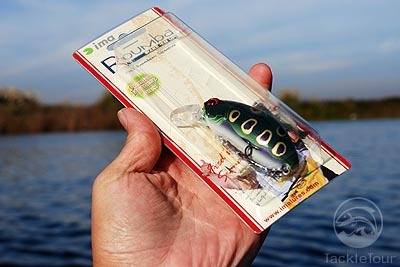 This interesting lure is able to generate a walk the dog type wobble all by itself and can be fished on the surface as wakebait, or subsurface with fast retrieves. About Ima Japan: American Anglers are just started to learn the name ima. Ima originates from the first three letters from the word �imagination.� The company is a mature hard lure manufacturer in Japan and earned its reputation by creating an extremely extensive and premium product line up for both fresh and salt water. The ima brand was launched throughout Japan in April of 1998 capturing the inshore market with the release of the komomo SF125, a super shallow runner that runs true at about one foot below the surface. Almost immediately, Japanese anglers realized the komomo�s fish catching ability and made it one of Japan�s best selling lures, reaching the five hundred thousand unit mark since its debut. The ima brand is now marketed world wide and ima Japan is making headway in the U.S. market initially by introducing a number of its existing models in several realistic colors. Over the past several years, they have teamed up with several B.A.S.S. Elite and FLW touring pros to design and create seven new baits that were released at the 2007 ICAST show. The Roumba is one such bait. The Roumba is available in nine different colors that cover a wide range of patterns from baby bass to bull frog and crawfish. 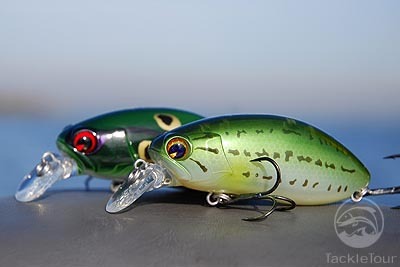 We focused on the two patterns in particular that really appealed to us for our region, the Baby Bass and the Bull Frog. The overall finish of the lures is exceptional, and similar in quality to what anglers would expect from a premium Japanese lure manufacturer. 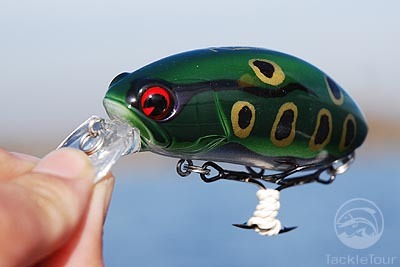 The beauty on this bait is in the details and each pattern is finished distinctively, for example the Baby Bass and Blue Gill have a glossy finish while the Stink Bug and Hot Craw pattern sport matte finishes. 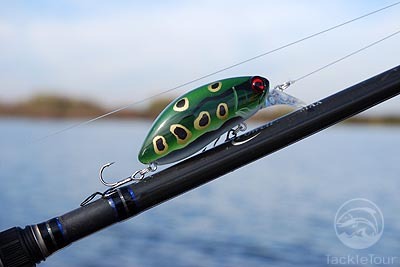 The bait�s profile is a combination of a crankbait and a spook rolled into one compact package. 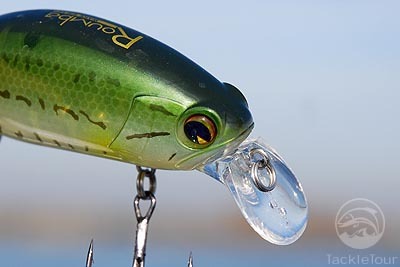 The face of lure looks even like a combination of a baitfish and a frog. The lure certainly looked like a quality bait, and it was time to see just how the Roumba performed on the water. Real World Test: To test the Roumba we head to Fred�s home water, the California Delta for the first round, and local northern California lakes in the second round to see if there was any difference in the way bass reacted to this bait.